Many thanks to Puijon Hiihtoseura for answering my questions in 2003! 1. When was the ski club founded? Who was the founder of Puijon Hiihtoseura? Mr. Armas Mytty, Mr. Johannes Kuitunen and Mr. Edvard Kujava. How many members did the ski club have by the foundation? How many members does Puijon Hiihtoseura have at present? Which kinds of sports are offered? Who is the president of Puijon Hiihtoseura? How many ski jumps are in Kuopio and which sizes do they have? When were the ski jumps built? Could you tell us some details about the K 120 ski jump? competitions and training is Puijon Hiihtoseura. What are the jury widths of the K 90 and K 120 ski jump? How many coaches are responsible for ski jumping? What are their names and tasks? How many ski jumpers are members of Puijon Hiihtoseura? Could you tell us some famous ski jumpers of the ski club of former times? Which ski jumpers of the ski club are member of Finnish A- or B-team? Can you tell us some facts about the history of the ski club? 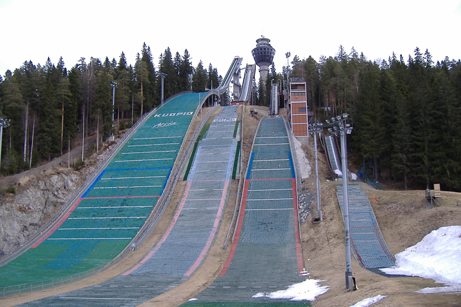 There will also be some English history of ski jumping in Kuopio. When did the first competition take place and who was the winner? Who were the top 3 of this event? Which ski jumper was allowed to open the K 120 in 1998?